Community Shield odds - 50/1 Arsenal or 30/1 Chelsea at Betfair! Risk-free! The Community Shield is the curtain raiser of the 2017/18 football season and Betfair are offering a double price boost on Arsenal v Chelsea! You can claim 50/1 Arsenal or 30/1 Chelsea to win the match in 90 minutes, with money back if you lose! Arsenal and Chelsea have already meet earlier this summer, with Chelsea running out 3-0 winners in a Beijing club friendly. As to competitive games, the Gunners beat The Blues 2-1 when they last met in the FA Cup Final back in May. Wenger's men have won the last two meetings at Wembley between these two. What will be the outcome after 90 minutes? Join Betfair via this page and claim 50/1 Arsenal or 30/1 Chelsea to win! Place your first bet (max £/€1) on Arsenal or Chelsea to win Sunday's Community Shield! 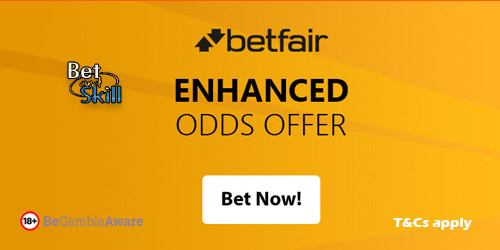 If you lose your bet, Betfair will give your money back! "Community Shield odds - 50/1 Arsenal or 30/1 Chelsea at Betfair! Risk-free!"